Tavistock Place trial this summer; stepped tracks on Gower Street-Bloomsbury Way; Tottenham Court Road buses and cycles only during hours of operation. The officers’ report on last summer’s consultation was published yesterday and the cabinet will make a decision on 21st January. See Camden Council Meeting webpages. the WEP is agenda item 16. The report includes a lot of new cycling provision added to the scheme after consultation with us. Loading and access would be permitted in certain sections of the street and at specific times of the day. If the trial showed that positive impacts outweighed any adverse impacts, the changes could be made permanent. This could also allow further improvements to Torrington Place and Tavistock Place to make the street better for residents, businesses and visitors, including widening pavements. I’m sure you all recall our campaigning video on Tavistock Place. The scheme will include stepped tracks 1.75 – 2 m wide on each side of Gower Street and Bloomsbury Street. The northbound route will move over to Tottenham Court Road via segregated tracks on Grafton Way and then northbound on Tottenham Court Road as far as the junction with Euston Road. No motor vehicles will be allowed to turn left from Tottenham Court Road into Euston Road so as to avoid left hook risks for those cycling up Hampstead Road. 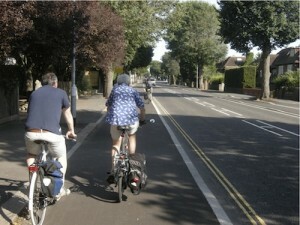 Given the council’s stated goals for the project, which include a radical shift in priorities towards cycling and walking, we had seen it as a major opportunity to achieve a protected North-South cycling corridor that might encourage many more people to travel to and around the area by bicycle, especially given the cycling propensity of university staff and students. But we were extremely depressed by the very limited space for cycling in the consultation plans which showed no segregated cycling provision on Tottenham Court Road and the inclusion of 1.5 m wide armadillo-segregat ed tracks on Gower/Bloomsbury Street. We remonstrated with Camden throughout the consultation period. We did independent width measurements at points on Gower and Bloomsbury Streets and we searched for a solution that would provide wider and more attractive cycle tracks here. Jean lighted on the idea of stepped tracks similar to the ones recently installed on Old Shoreham Road in Brighton/Hove. She presented the idea at our Public Meeting held during the consultation period and included it as a ‘red line’ in our response to the consultation. Stepped tracks are a level midway between footway and road. The limited pavement space on Gower Street had been a barrier to providing wider cycling track. They undertook a Pedestrian Comfort Level survey at each pinch point on Gower and Bloomsbury Streets and concluded that wider tracks could be accommodated but for the sake of pedestrians the width can’t always reach 2m. They reduced the design width of the motor vehicle lanes to just 3 m in places. The substantial additional cost of the stepped tracks was accepted as good value for money in this high-profile project. Loading and parking: Remove all parking from Gower Street and Bloomsbury Street (loading bays would be available on Gower Street between 10am and 2pm, Monday to Sunday). As in the consultation, Camden proposes a “bus and cycle street” from 8 am to 7pm (Monday to Saturday) with local access for cars, taxis and loading on short sections of Tottenham Court Road via side roads. TCR will have a pair of 4.5m wide carriageways to be shared by cycles and buses (90 buses per hour in each direction) and by the additional local traffic. The provision of two 4.5m lanes on Tottenham Court Road would allow sufficient space for buses and cyclists to safely overtake each other. Raise the road to the same level as the pavement, in certain areas, to slow traffic. Loading: The consultation proposals allowed loading on TCR from 7am to 10am and from 4pm to 8pm in the unrestricted sections and from 7am-8am and 7pm- 8pm in the restricted section. But the report recommends a trial would allow loading on these streets from 5am to 7am, 10am to 12pm and 7pm to 10 pm and would investigate increasing loading restrictions on side streets. Long distance north south cycle route all along Gower Street and Bloomsbury Way linking via a two-way Endell Street to the route in Westminster down to Waterloo bridge.